Fleece cargo shorts feature elastic waistband for a customizable fit. Full elastic waistband with inside drawstring Side slant pockets Side cargo pockets with Velcro® closure Back patch pocket with Velcro® Fabric: Cotton/polyester knit. Machine wash; imported Big inseam length abt. 10" Tall inseam length abt. 12" Our Expert Opinion Cargo shorts + fleece? Yes please. 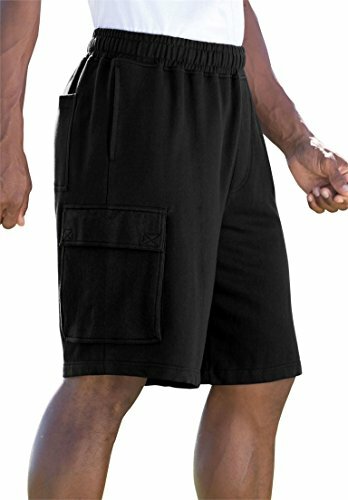 These big and tall cargo shorts are made with soft fleece to keep you comfy all day long, making them a smart alternative to traditional shorts. This cotton fleece is just as durable as the fabric used in regular cargo shorts, just comfier! Also includes the classic cargo many-pocket design, with Velcro® on back and side pockets.